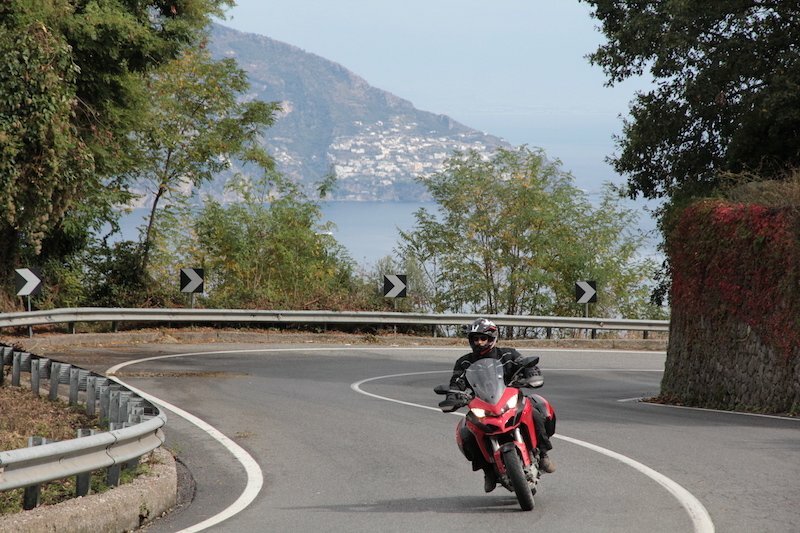 Often overlooked due to time constraints, Southern Italy is a playground for motorcyclists. 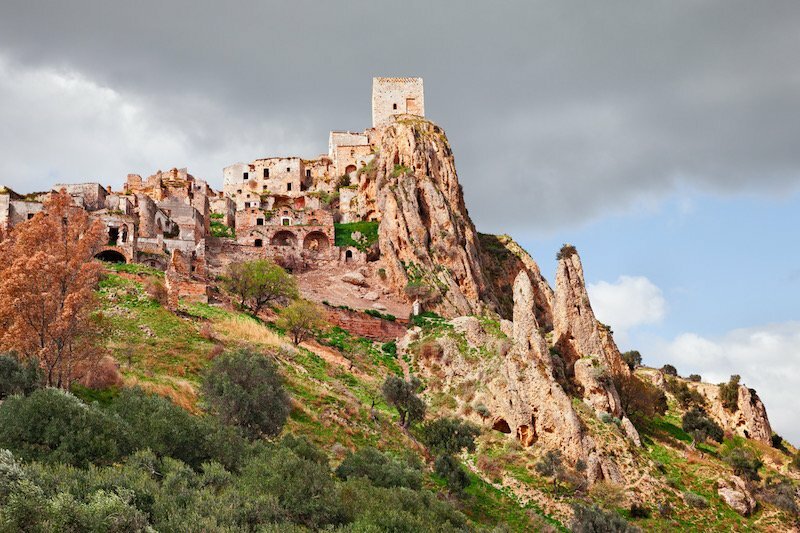 From the spectacular Amalfi Coast to the troglodyte town of Matera and Aspromonte National Park in the deep south, the feeling of being on an adventure is guaranteed. 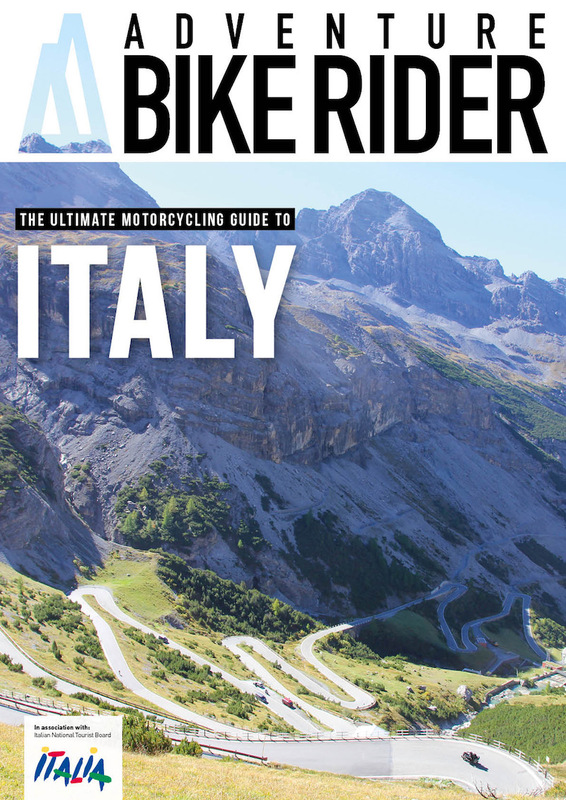 For the purpose of our Ultimate Guide to Motorcycling in Italy, we’re talking about the regions of Molise, Campania, Apulia, Basilicata and Calabria. Think of all the area below an imagined line drawn across the country mid-way between Rome and Naples, or the lower shin, ankle, heel and toe. The Gulf of Naples, also called the Bay of Naples, is a spectacular sight. Bordered on the north by Naples with Vesuvius in the east and the Sorrentine Peninsula and the Isle of Capri in the south, it looks all the more impressive when you arrive by boat in the early morning. It’s a 14-hour overnight crossing by ferry from Cagliari in Sardinia to Naples on the mainland, with the regular docking time of 9am. The early morning arrival by sea, if the weather allows, means you get a great perspective of just how huge and threatening Vesuvius actually is and time to contemplate the writings of Pliny the Younger, the only surviving eyewitness to document the eruption of AD79, which buried the nearby towns of Pompeii and Herculaneum. Make the most of this peaceful pondering time for, once disembarked in Naples, the world turns manic and chaotic. I’ve talked to some who would advise staying well clear of the commotion of driving in Naples, but I have to say I actually liked it. You’ll have to keep your wits about you and a keen eye on every other road user and pedestrian within sight, but there is something quite charming and exciting about this southern Italian city which I reckon should not be missed. And the road manners do not improve as you head south past the ancient Roman city of Pompeii, which was preserved under 6m of volcanic ash and pumice in the eruption of AD79. It’s an incredibly busy tourist attraction but also one you’d regret not taking time to park up and explore. From Pompeii we continued south west through the equally busy and charmingly chaotic Sorrento and followed the road to the village of Termini, the last village on the Peninsular before the land drops dramatically into the sea, the isle of Capri sitting pretty a few miles off the coast. 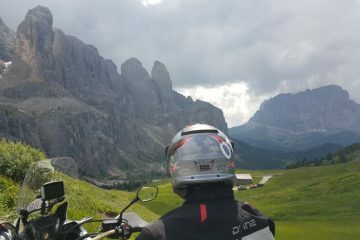 After a quick coffee we were off to ride one of the most spectacular coastal roads in the world let alone Italy. The Amalfi Coast is world renowned for its dramatic beauty and is yet another Italian spectacle listed as a UNESCO World Heritage Site. 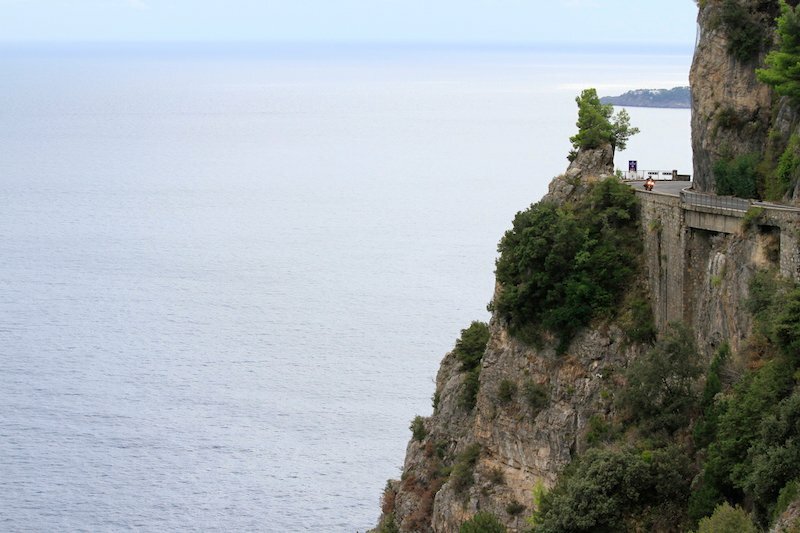 The narrow road follows a 32 mile stretch of coastline along the steep and precipitous edge of the Sorrentine Peninsular. In parts it’s cut out of vertical cliff faces which plunge into the sea below and it is a very popular tourist destination which all means it can get hugely busy in the prime summer months. On a previous visit, my objective was to park up for a few days and check out the spectacular hiking trail called ‘The Path of the Gods’ which kicks off in Positano and follows an audacious line across the huge cliff faces – if you fancy it you’ll need a head for heights. 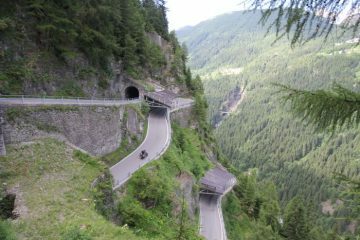 If it were not for the number of cars and tourist buses on this narrow, winding road it would be a fantastic riding experience. But do not let the thought of congested roads put you off, the natural and man-made sights on this route are outstanding and none more so than the pastel coloured fishing villages, grand villas, terraced vineyards and lemon groves which cling to the precipitous shoreline in outrageous positions and locations. I guarantee that a trip down the Amalfi Coast is impossible without the thought of ‘who the hell would have thought of building that there’ a constant companion. Heading south from Salerno, the city which marks the end of the Amalfi Coast, there are numerous options to continue with your Grand Tour of Italy, though I would suggest avoiding the main roads and just taking your time to explore the culture and sites en-route to Sassi di Matera, otherwise known as the ‘Underground City’ which has been in constant habitation since the 10th century BC. The historical centre is yet another UNESCO Site. Travelling on down to the toe of Italy from Matera, take a small diversion to the remarkable and haunting old ‘ghost town’ of Craco and stay on the SS103 to witness one of the most extraordinary civil engineering projects I’ve come across. In the middle of nowhere, the SS103 has been raised over the surrounding countryside on stilts where there is no logically apparent reason to have done so. 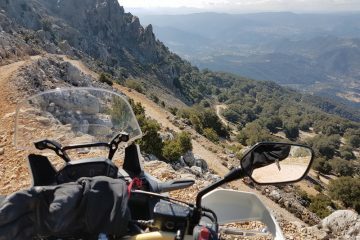 If time allows, the roads and trails in the Pollino National Park make for superb motorcycle territory and the sights within what is Italy’s largest national park come as a bit of a surprise being this far south. The highest peak in the park is 2,267m (nearly 1,000m above the UK’s highest summit, Ben Nevis) and it’s famous for hosting the oldest scientifically dated tree in Europe, a Heldreich’s pine aged 1,232-years-old. 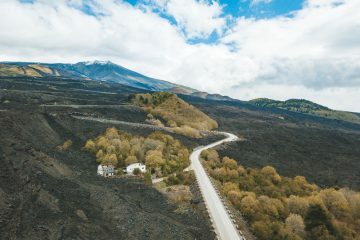 And just before you head on over to Sicily, make time to ride a couple of roads or trails in the Aspromonte National Park right in the toe of Italy’s boot. It’s another spectacular region featuring high mountain roads and remote villages. In days gone by this remoteness meant that the region was used by the local Mafia, the ‘Ndrangheta, as an ideal hiding spot for contraband and victims of kidnap. There’s no need to worry now though, the park is both tourist and biker friendly. From the park, it’s no more than a two-hour ride to the port town of Villa San Giovanni where there are multiple crossings per day into Messina on Sicily. The crossing is just shy of four miles and takes approximately 20 minutes. You do not have to buy a ticket in advance and, as of writing this, the one way cost for a motorcycle crossing is €7. 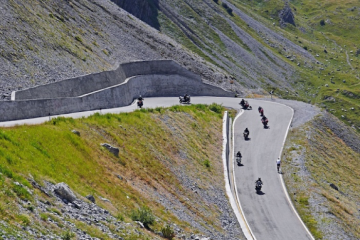 If you’re thinking of heading to Italy on your next motorcycle tour, then check out our Ultimate Guide to Riding in Italy. With 24-pages of useful, informative and inspiring content, it’ll help you plan out your next tour. Fill in the form below to get your guide.